I found this book to be a balanced and insightful analysis of the OECD's influence on educational reform through its PISA assessment and league tables. It is academically rigorous enough for me to use it as part of a doctorate literature review but readable enough for me to enjoy reading it! Recommended for anyone interested in education policy whether from a pro-market or pro-state point of view. I read this book with no special expectation. 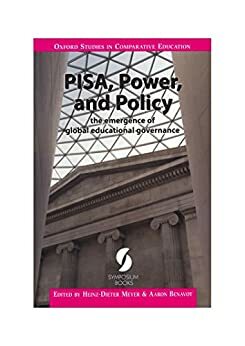 But "Pisa, power and policy" shows many views on the issue and is interestingly written, why I warmly recommend it, especially today when the 2012 PISA result will be official. The books helps you understand the complexity of education and the hazardous task with measuring the same way in completely different contexts. Thank you so much for putting such a brilliant collection of papers together! A real must-read for anyone interested in or researching current trends in education.